We, here, at Paint Touches don’t really have the time to record a podcast, so instead we’ve got a bit of a Simmons/Ford-esque back-and-forth for you here. We hope to do this a few times over the course of the offseason (we’ve also got some features were’e excited about to unroll closer to the stat of the season) on both topics regarding the upcoming season and some more laid-back content. Andrei Greska: So Mark, let’s get the important stuff out of the way first: If you had a buck twenty to drop on one of those throwback Marquette jerseys, which one would you pick? 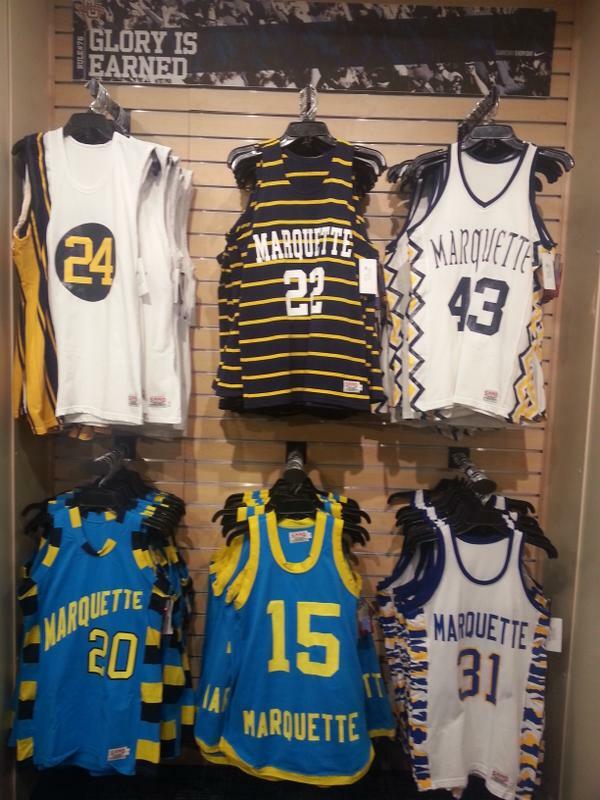 Mark Strotman: To be honest, of all the happenings this offseason I wouldn’t have guessed the Marquette Spirit Shop would make the biggest splash by putting those jerseys on sale. But here we are, and I have no clue what I would pick. First of all, the journalism industry has blessed me with plenty, but $120 laying around isn’t one of them. I know that based on your write-up of Marquette’s throwbacks three years ago that you would pick the Mo Lucas baby blues, and I can’t argue with that. But I suppose if I had to pick a throwback jersey, I’d use the criteria for picking it that I do other ones: make a statement. No one cares about the player it is, especially if all the options are all-time greats like they are at the spirit shop. The best throwbacks are the flashy jerseys; Vince Carter/Raptors, Charles Barkley/Suns, Allen Iverson/Sixers, any powder blue Chargers jersey. And for that reason, I’ve got to go with the Earl Tatum, zig-zag jersey. Though he had been out of the NBA more than a decade by the time I was born in 1990, all I’ve heard makes Tatum one of my favorite Marquette players not named Jae Crowder or Chris Otule. And those jerseys! The zig-zag pattern is incredible and I really can’t think of any other jersey that implements it. And if that weren’t enough, the gothic font is also as unique a lettering as there is in throwback uniforms. The jersey looks like it belongs inside Gesu more than it does the Al McGuire Center, and for that reason it’s my choice. That’s a statement made. Those jerseys are beautiful, Tatum became one of Marquette’s best ever and he appeared in a national championship game while donning those uniforms. That jersey had it all. There won’t be a 30 for 30 on it, but it rocked. Now, Andrei, I’ve got a two-part question for you: What’s the best part of fatherhood you didn’t expect (Andrei and his lovely wife, Amanda, brought a beautiful daughter into the world in February)? And how can you convince me that Henry Ellenson will be a better collegiate option than Diamond Stone, who seems to have moved on from Marquette as the bluebloods begin to poach? AG: Oh man, way to put me on the spot. There’s a ton of little things like catching her doing something cute on camera, getting the diaper on just as she’s starting to pee, or seeing her reach a milestone for the first time. But nothing will ever beat getting woken up by one of her giant smiles. It’s no where near fun most days to only get 6 or 7 hours of choppy sleep, but zombie though I may be, seeing that unbridled joy in her face makes it all worth it. Diamond Stone is also an elite prospect, and the team that does end up landing him will be darn lucky, but he is a prototypical five. I’m not saying he can’t develop that part of his game, but thus far he hasn’t shown the ability to step back and handle the rock a la Henry. Again, this is not to criticize Diamond. He’s a legitimate lottery candidate in 2015 and was called “probably the best high-school post scorer we’ve seen since DeMarcus Cousins” by recruiting guru Evan Daniels. But if you’re saying I can have Dirk-lite, I’d take that any day. There was a rush on MU predictions for Henry from recruiting experts on 247’s Crystal Ball after Wally Ellenson, Henry’s older brother and a world-class high-jumper, decided to transfer from Minnesota to Marquette, but I wouldn’t call it a done deal just yet. With that being said, how would you grade Coach Wojo’s recruiting up to this point? How would that change with a 5-star like Henry in the fold? So instead of chasing a big man with immediate eligibility that wasn’t coming, he honed in on point guard Matt Carlino and forward Gabe Levin, the latter of whom will sit out this season. The stat you’ll hear all year is that Carlino made 60 3-pointers last year, three fewer than Marquette’s starting point guards the last FOUR seasons. Carlino was an important get, as it will now allow Duane Wilson some time off the ball, and it gives Marquette another senior in the locker room. Levin is going to do some things once he’s eligible, and while Wally Ellenson likely will be just “a guy,” the hope is his brother likes him enough to play with him the next few years. And though Wojo didn’t find his big man for 2014, he got him in 2015 with Matt Heldt. I really like this signing, and all reports on the AAU trail are that he’s the real deal. I’ll also chalk Nick Noskowiak up to Wojo, and that’s a big deal. He could be the point guard of the future. I’ll chalk his recruiting up to a solid “B” because Heldt and Noskowiak are core commitments. Carlino and Levin weren’t home-run hits, but again any head coach is going to make due with what’s he got. The reality is Wojo’s report card will take a big jump or fall depending on who he can bring in to fill out the 2015 class. Again, I’m cautiously confident. Let me ask you an either/or to wrap this one up: Are you more excited long-term about Duane Wilson or Jajuan Johnson? AG: Way to put me on the spot there. I think both have tremendous potential but I’m going to have to go with the guy I’ve been riding with since 2012, Duane Wilson. He was the first recruit I got to watch up close while he was in high school so there is definitely a bias, but what I consistently saw left me awestruck. The way he galloped across the court, or soared above the rim was like nothing I’d ever seen in person before. He could hit shots from any spot in the court and went hard at all times, even meaningless summer scrimmages against baby-faced high-schoolers. Yes, he faced some weaker competition at Dominican. Yes, national writers didn’t put him in the top-50 of the 2013 class. Yes, the injury that cost him all of last year may have altered his game the same way Cadougan’s Achilles altered his. Even taking all that into consideration, I’d still put my chips on Duane. Jajuan is a scorer at heart, and has the makings of being a rather good one. Duane is a player at heart. He sees the court like a true point-guard, can shoot the ball from the perimeter and take defenders off the bounce. He has the agility to be a lockdown defender with some added strength and experience. Best of all though, he has the makings of being the kind of leader, both vocally and on the floor that went AWOL last season. Now, I’m not saying he’s a sure thing to take over at Marquette and become a go-to guy in the coming years. There’s always the risk of falling into the backup-QB syndrome that plagues fans, wherein the player not on the field always looks better than the one on it. We saw JJJ struggle to get minutes, take ill-advised shots and make James Harden look like Jimmy Butler on D last year. All we saw of Duane were leg braces and dress clothes. There were no reports of him being the best player in practice and were grumblings about him being over-matched at this level. I’m completely aware that the learning curve for an on-and-off ball guard is steep. Give me his attitude, his fire an his desire to be in the blue and gold. When Buzz left, he was the first to say he wasn’t going anywhere. There’s something to be said for that kind of loyalty. Oh, and he’s not too shabby at this netball thing. You’re going to like the way he looks, I guarantee it.